Open grill or full hotplate? Safety: most barbecues on the market MUST have an open grill so that air can get to the gas burners beneath (for combustion purposes). 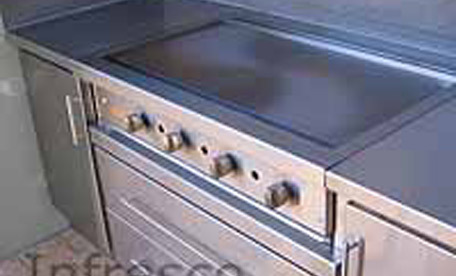 However, Infresco Gourmet Barbecues are designed in such a way that we can build them with a full hotplate. Cleaning: There is more cleaning with an open grill as the fat and food falls through to the bottom of the barbecue. With an infresco BBQ it’s easy to clean as the bottom tray pulls out for easy cleaning. However if cleaning up after a BBQ is not something you like to do, then you might like to consider a full hotplate. Open grill or branding lines? For those who want an open grill but can’t have one due to height restrictions with their exhaust hood, we can install a hotplate with branding lines. This still gives the effect of a grill, and it’s a popular option with many of our clients. Do you love flame-grilled steaks and vegies? If so, then you’ll probably prefer an open grill. Do you love teppanyaki cooking? Then a large hotplate will be best for you. Remember, at Outdoor Alfresco Kitchens we manufacture every Gourmet Barbecue to order. We can give you the hotplate and open grill size that you require.And of course we can insert a wok into your barbecue too! *Note this information is given in good faith. Regulations can vary from state to state and also internationally.